Can independent nations unify politically? Amitai Etzioni raised this searching question in his seminal 1965 book, Political Unification: A Comparative Study of Leaders and Forces. In this revised editionnow with an extensive new introductionEtzioni convincingly argues that the experiment of collective self-determination is the only viable replacement for a perilously overloaded international system. 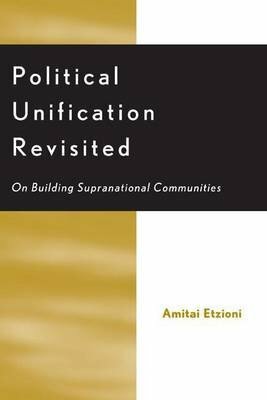 This fascinating work debates the limitations of informal networks of governance, transnational agencies and cross-nation bondingincluding the grand experiment of the European Unionto argue that only a truly transcendent supranational community can effectively succeed the nation-state. He doubts whether the traditional system of international relations can withstand the threat of transnational forces. Old-fashioned diplomacy can neither prevent weapons of mass destruction and hate material moving easily across national borders, nor deal with mass cross-border immigration in the wake of civil war and the rise of political and ethnic separatism. Political Unification Revisited is essential reading for political scientists and scholars of international law and international relations seeking to navigate the path from national sovereignty to world government in the 21st century..